Out of print since 1938, the long awaited re-issue of On Sarpy Creek is finally here. A publishing project of Bedrock Editions in partnership with Riverbend Publishing (both of Helena, Montana) this wonderful novel can now be read and savored by readers everywhere. Set in eastern Montana during the drought years following World War I, the story centers on the lives of the homesteading families who live on Sarpy Creek. This is a drama with heart and emotion, but is not overly sentimental. The characters are richly drawn: their thoughts, actions, and words are honestly and genuinely portrayed. This is the kind of story that pulls you in and doesn't let you go until the last word is read. On Sarpy Creek is Ira S. Nelson's only known work, but all who read it consider it a little masterpiece. Simple, yet profound, this family saga is complete with births and deaths, passionate, tender love and marital strife, a shocking murder, inner struggles about spirituality and existence, and the power of love and loyalty that sometimes, but not always, overcomes adversity and hardship. Beautifully written in spare, straightforward prose, Nelson's treatment of the authentic vernacular of the time and place is lyrically interwoven with narration that gives equal treatment to the environment that is home to the residents of Sarpy Creek. Along with the people, the land, sky, creek, animals, and weather all play critical roles in the telling of this Montana story. 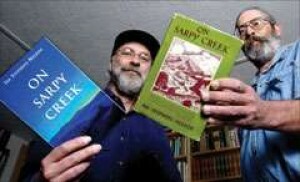 On Sarpy Creek deserves a chance to to claim its place in the rich tradition of Montana literature. It is available in book stores throughout Montana, through most online booksellers, especially Riverbend Publishing, Alibris Books, or by contacting Bedrock Books. First reader review in Amazon.com gives On Sarpy CreekFIVE STARS! A reader from Bozeman, Montana: "A deceptively simple novel, this is a profound work of art, an exploration of love and courage and hope; it tells of a farm family in Montana in the 1920s; tells of the connection of people to the land, in all its beauty and richness and harshness; tells of being connected to other people on the deepest levels. I cannot praise this book highly enough: it has depth but is a joy to read. Published first in 1938, it is a real find." We have Chris Cauble of Riverbend Publishing and Bill Borneman of Bedrock Editions to thank for reissuing this gem originally published in 1938. Set in the early 1930s on Sarpy Creek (a tributary of the Yellowstone River) east of Billings, Nelson tells the fictional story of the Gyler family whose roots (and feelings) run deep in that tough land prone to drought. Some of their children stay and some go away from Sarpy Creek, but the place never leaves them. They simply wander and return as does the creek. Nelson lays out the tale simply, without embellishments or fancy words, and the story is all the more effective, and effecting, for it. "Her eyes turned down to her own home, with its setting of big shady trees. It was a pretty sight from up here. The wild-cherry bushes were scarlet patches, here and there, some in the very yard, some following closely along the turning, meandering Creek's water as far as the eyes could see." Jacob is the troubled son who believes his future lies away from Sarpy Creek. After a difficult marriage to which he never really adjusts, he leaves. His abandoned wife, Frace, cares more for the land than he does and stays to bring up their son. Case is the hardworking son who loves the land and also, despite ethical lapses involving another woman, loves his devoted wife, Sareeny, and prays she never learns about his wandering ways. According to an afterword, Nelson was born in Oklahoma but attended country schools while living on a ranch in Montana. He intended early on to become a writer but traveled widely and held many jobs to support himself. Nelson's first and, it turned out, last novel earned praise from many quarters and was mentioned in Joseph Kinsey Howard's "Montana Margins" in 1946. Nelson died in 1994 without publishing anything more. 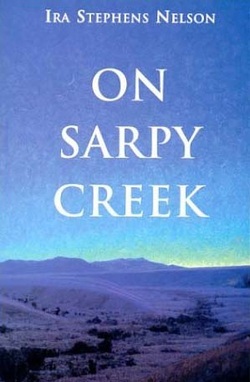 The afterword simply states the reason for reissuing "On Sarpy Creek" now, nearly 70 years after it first appeared: "The book deserves a chance to claim its place in the rich tradition of Montana literature."